Parents are encouraged to begin the admissions process by visiting campus to learn more about our school. They can attend one of our Open Houses or arrange for a personal tour of the school. By visiting campus parents will learn out about our program, tour the school, and observe our students and faculty partnership in action. During Open Houses, potential applicants can also meet alumni students and their parents, and learn about how Villa Maria School set them up for success at their current school. Completed the online application form – Click Here. $100.00 application fee – Pay it online here. Current psychological evaluation with WISC, achievement and emotional testing. Specialists’ evaluations and reports (speech and language, auditory processing, occupational therapy, physical therapy, or assistive technology). Confidential evaluations, completed by a teacher, tutor or therapist who works with the child. A current photo of child. Child’s transcript, IEPs and report cards for the last two years, and a copy of the complete health record. These records must be forwarded from the child’s school. Complete the release of records form and give it to child’s current school. During the process of compiling the materials for the complete admissions file, we look forward to hosting your child for a two-day visit to campus. During the visit, the applicant will attend classes with a student “buddy”, join classmates for lunch, and complete curriculum based assessments. 4. The Admission Committee will meet and make a decision. Based upon the information provided in the admissions packet, the notes from the school visit, and information provided from meeting with the applicant’s family, a formal admissions decision will be made regarding the enrollment status of the applicant. Acceptance is on a rolling admission basis. Parents will be notified by phone and by mail of the Admission Committee’s decision within a week of your child’s visit. Acceptance: The Admission Committee has decided that our program is an appropriate placement to meet your child’s needs. Wait List: The Admission Committee has decided that our program is an appropriate placement to meet your child’s needs, but there is not a space available at the present time. You will be notified if a space becomes available. Non-acceptance: The Admission Committee has decided that our program is not the appropriate placement to meet your child’s needs. Admission decisions are made independent of financial need. There is limited financial aid available for families who demonstrate financial need. A student must be accepted before he or she will be considered for financial aid. 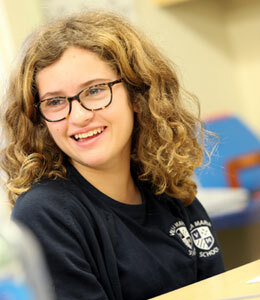 Please call Stephen Bennhoff, Assistant Head of School for Admissions and External Relations, at 203-322-5886, extension 104 or e-mail admissions@villamariaedu.org if you have any questions about the application process.